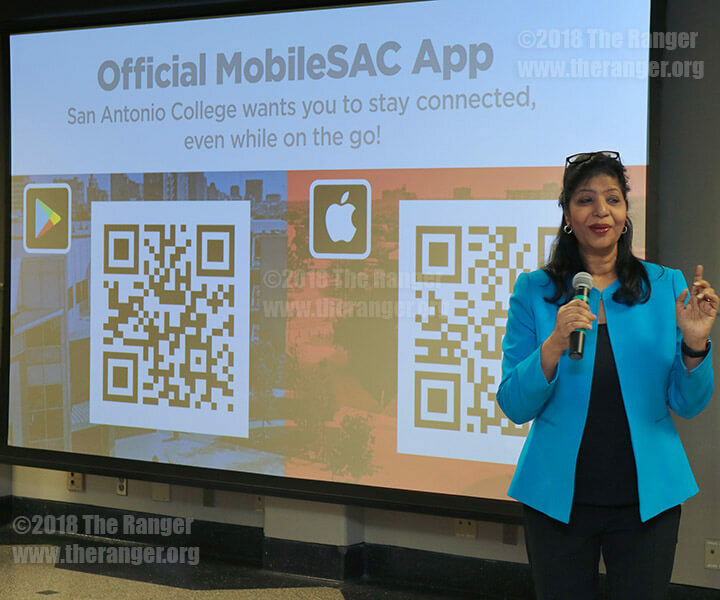 During a “Welcome Back” gathering for faculty and staff, Usha Venkat, director of information technology, guided assembled faculty and staff through the new Mobile SAC app. The app was developed to help students and faculty easily access important college resources. Venkat said this college is the first of the Alamo Colleges to have a general help app like this. The app is free and can be downloaded from from the IOS App Store and Google Play. Venkat said the app will enhance the college experience for both faculty and students. “It will provide convenient access to many of our key systems and services,” she said. An interactive campus map that allows for easy navigation through this college. App users can use navigation on the map to highlight the quickest route to locations on campus. A campus tour video that highlights several departments and programs available at this college (more programs will be included at later dates). Access to the library catalogue and databases. This college’s Instagram, Twitter and Facebook feeds. A live feed to this college’s radio station, KSYM 90.1. QLess, a service that allows you to set up appointments with the services hosted by the campus. Services include the admissions office, assessment center, math department, SAC tech store, SLAC, the student mega lab, veterans affairs, world language and ESL, the welcome center, International student services, information center and the transfer and career center. This college’s free Reach Out App (separate app required). The SAC Tech Store App (separate app required). 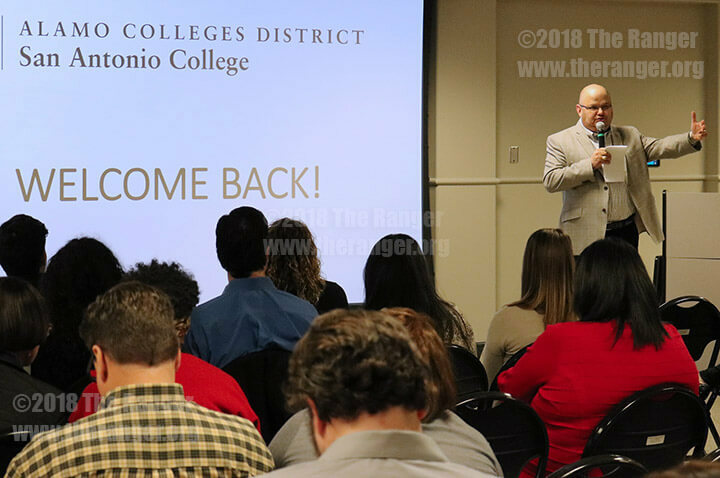 Hoping to get this college’s faculty and staff ready to face the upcoming semester, college President Robert Vela and the college executive team hosted an informal gathering Jan. 10 in the Fiesta Room of Loftin Student Center. Vela thanked the faculty for the work they do for this college and the student population. The event allowed Vela to discuss this college’s accomplishments from 2017. This college was able to meet its WIG of 5,531 awarded degrees and certificates. The new WIG, or wildly important goal, for awarded degrees and certificates is 6,253. Travis Early College High School received a national Blue Ribbon award from the U.S. Department of Education. This college’s mariachi group, Estrellas del Alamo, won second place in the Vargas International Mariachi Extravaganza. In mid-April, English Professor Liz Ann Báez Aguilar was appointed as the president of the Texas Community College Teachers Association, the largest organization of postsecondary educators in Texas. Aguilar is the first Hispanic female to serve as the president of TCCTA. The human services program became the first in Texas to earn NASAC accreditation. This college was placed on the Aspen Institute’s top 150 community colleges list. This college’s accreditation status was reaffirmed by the Southern Association of Colleges and Schools Commission on Colleges through June 2026. “We have a lot to be proud of,” Vela said.